Tag line: "Rich is their humor! Deep are their passions! Reckless are their lives! Mighty is their story!" John Ford, that prolific director of such classic westerns as Stagecoach, My Darling Clementine, The Searchers and The Man Who Shot Liberty Valance, won a whopping four Academy Awards for Best Director, not a single one of which was for his work on a western. Along with The Informer in 1935 and The Quiet Man in 1952, he was awarded back-to-back directing honors for The Grapes of Wrath (in 1940) and How Green Was My Valley (in 1941). 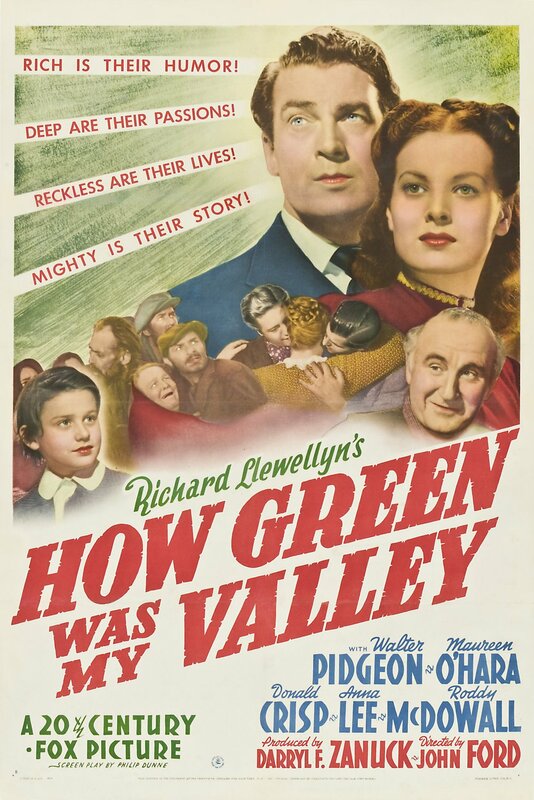 Based on Richard LLewellyn’s popular novel of the same name, How Green Was My Valley tells the story of the Morgan family, and how changes in their community threatened to tear them apart. Now a man, Huw Morgan (Irving Pichel) looks back on his childhood in the small Welsh mining town where he was born. Told mostly in flashback, we meet a young Huw (Roddy McDowall) at a time when his father Gwilym (Donald Crisp) and his elder brothers all worked in the coal mines, earning enough to support their large family. Huw’s mother, Beth (Sara Allgood), with the help of his sister Anghaard (Maureen O’Hara), always kept food on the table, and times were generally good. That is, until the mining company reduced their wages. Unwilling to accept the pay cut, the workers go on strike (Gwilym doesn’t believe in unions, while his sons, who support the strike, stand against their father). Meanwhile, Anghaard, who’s developed feelings for the new preacher, Mr. Gruffydd (Walter Pidgeon), is being courted by Lestyn Evans (Marten Lamont), the mine owner’s son, and a man she doesn’t love. There are some wonderful scenes in How Green Was My Valley, from simple moments, like when Huw, reflecting on happier times, recalls, in great detail, what happened when his father and brothers came home from work in the evenings (one of their rituals was to go into the back yard and scrub the coal dust off their bodies), and when his brother Ivor (Patric Knowles) married the beautiful Bronwyn (Anna Lee), a wedding that brought the entire town together. Each of these moments (and more besides) reveals the intricacies of life in a small, working class town, giving depth to both the characters and the community. But How Green Was My Valley also explores the differences between parents and their children, and how one generation’s beliefs aren’t always passed on to the next. When his sons talk about joining a union to fight for fair wages, Gwilym, who considers unions “Socialist nonsense”, stubbornly refuses to discuss it with them. How Green Was My Valley is both a fond recollection of days gone by and an exploration of how a changing world can bring about the end of traditional values. As John Ford shows us, it’s nice to occasionally reminisce about the past, but awfully dangerous to stand still and ignore the future.